Dreamtime - Commentary Inspired By Bob Dylan's Theme Time Radio Hour: "The He-Man Martha Raye"
Here's Amos Milburn with the first of his boozy smash hits, Bad, Bad Whiskey, from 19 and 50, which he would follow with Thinking and Drinking, Let Me Go Home Whiskey, One Scotch, One Bourbon, One Beer and in 19 and 54 an answer song to the original, Good Good Whiskey, which would be his last hit. 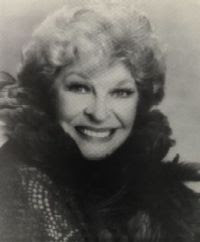 Outside of the mystery of the "He-Man Martha Raye" moniker, which piqued Mr. D.'s interest in the "Beginnings, Middles, and Ends" episode, Milburn's on-line biographies tend to contradict each other. The Wikipedia article - which the Amos Milburn web page, maintained by his nephew repeats - claims, "there is no evidence that Milburn had a drinking problem," the article itself citing a 1997 book on blues singers as its source. However, Milburn's All Music Guide entry claims, "Alcoholism later brought the pianist down hard, giving these numbers a grimly ironic twist in retrospect..."
That undated All Music Guide article by Bill Dahl also may be the original source for the story about Milburn's nickname, and gives an interesting perspective on how information propagates on the Web. As Our Host alluded to, a dozen articles about Milburn on the Web use exactly the same phrase... "The self-taught 88s ace made a name for himself as the 'He-Man Martha Raye' around Houston before joining the Navy and seeing overseas battle action in World War II..." with no explanation about why Milburn was billed as the testosterone equivalent of Raye. Milburn enlisted in the Navy in 19 and 42 at the tender age of 15 according to various biographies. By 19 and 42, Raye was established as a wisecracking singer/comedienne and had earned her own nickname, "the Big Mouth," as her mouth seemed disportionately large to the rest of her face, especially when seen on screen. Raye would capitalize on the disadvantage, making her mouth up to appear even larger, and eventually becoming the spokesperson for Polident denture cleanser in the 1970s and 1980s and appearing in innumerable commercials. While Milburn's mouth doesn't appear unusually large, maybe he did some sort of loudmouth Raye schtick as a kid. I've emailed Milburn's nephew about the question to see if I can satisfy both my own and Our Host's curiousity.